The strong ties between Turkey and Venezuela are set to continue as the Vice-President of the latter country is in Turkey on an official state visit. Vice President Tareck Zaidan El Aissami Maddah has visited a gold refinery in the Black Sea region province of Çorum (about 629 km east of İstanbul) where tons of Venezuelan gold are expected to be processed. Turkish President Recep Tayyip Erdoğan refers to Nicolas Maduro, Venezuela’s President as a brother. Turkey is continuing to build a special friendship with Venezuela, where the economy has fallen by nearly 50% since 2013 and the annual inflation rate at the end of 2018 was at 80 000%, the highest in the world. The Venezuelan vice president, together with his officials, landed by a private plane at Merzifon Airport in Amasya, the neighbouring province of Çorum. 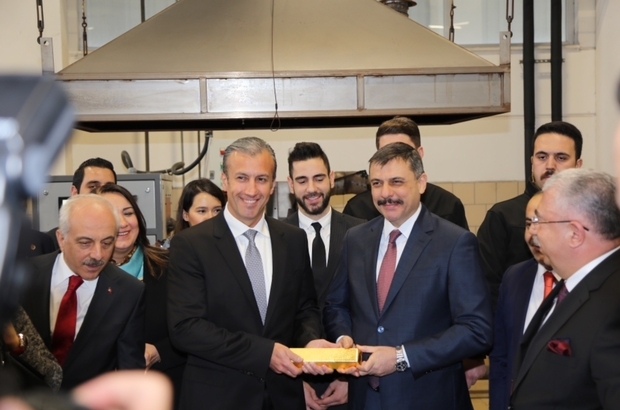 During arrival, Maddah was officially welcomed by Çorum Governor, Mustafa Çiftçi and executive board chairman of Ahlatçı Holding, the owner of the gold refinery. During Maddah’s visit, inspections of the Çorum Golden Refinery will be conducted and a meeting on possible trade cooperation will be held between Turkey and Venezuela, one of the biggest gold producers in the world. According to a World Gold Council report, published in June, the country has 150 metric tons of gold reserves, which makes it the 25th largest gold reserve in the world. Following his official visit to Paraguay last December, Erdoğan then continued his trip to Venezuela in his private jet. During his arrival, he was welcomed by Maduro. Venezuela also offered Russian companies to take part in gold exploration and gold mining in the country, according to the Russian Ambassador to Venezuela, Vladimir Zaemsky. This comes after the diplomat held bilateral economic cooperation along with the processing the gold mines in Venezuela. Apart from proven oil deposits, considered the richest in the world, Venezuela is considerably rich in natural resources such as diamonds, gold, iron ore, aluminium, bauxite, natural gas, and petroleum, yet it struggles economically. Last December, Caracas and Moscow signed a $5 billion investment deal to raise Venezuela’s oil production by one million barrels per day. After a controversial election, Maduro is to begin a six-year term on the back foot of a collapsing economy with no signs of recovery. Latin American countries those neighbour Venezuela are refusing to recognise his election, together with most parts of the international community. Venezuela has strong dependence on oil, which generates about 96% of its export revenues. The fall in oil prices has occurred at a time when the South American country faces runaway inflation and a severe scarcity of basic products. The proven oil reserves in Venezuela are recognised as the largest in the world, totalling 297 billion barrels as of 1 January 2014. Apart from proven oil deposits. In December 2018, in its Monthly Oil Market Report, OPEC announced that according to secondary sources Venezuela’s November 2018 oil output was 1.1 million barrels daily. This represents a stunning 41 percent decline compared to the daily average for 2017 and is 26 percent lower than at the start of 2018. The pace at which the troubled Latin American nation’s oil output is deteriorating will likely see it fall below 1 million barrels daily during 2019.